Lazy phone blogging! It’s eleventy billion degrees in Melbourne right now, and therefore too hot to do anything useful. But here’s a yummy treat to keep your toddler occupied and cool. Watermelon is selling for 90 cents a kilo at my local supermarket right now. If I were a better person it would come from a farmers market, but no. 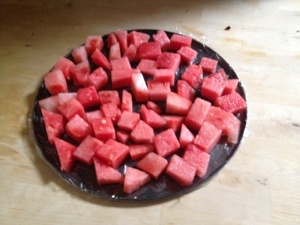 I’ve covered a flat baking pan in cling wrap and cut up some delicious watermelon, and put it in the freezer. You know what’s better than delicious watermelon in the summer? Delicious FROZEN watermelon! It’ll keep the little one cool while being a lovely tasty treat, plus because it’s frozen it can’t be wolfed down in 30 seconds flat like watermelon usually is in this house. Give it a try! This recipe is a quick and easy fallback for me when I’m stressing about what to give Sebastian that’s quick, fresh and nutritious. It takes just five minutes if the rice is pre-prepared, so I usually cook extra rice with some other meal, and hold onto it for a day or two until I’m ready to make a batch of these corn cakes. Combine ingredients in a large bowl until mixed. Heat a large pan with your choice of butter/marg/veg oil over a medium heat. Dollop big spoonfuls into the pan, allow to brown and then flip. Cool before serving to your toddler, and store extras in the fridge or freezer. I use jasmine rice because it’s what I always have in the house, but you could try long-grain or brown rice too. I use self-raising flour because it makes the cakes nice and fluffy, but plain flour works just as well. Try adding different finely chopped vegetables like red capsicum, grated carrot or pre-cooked broccoli. My Mum has tried adding diced bacon, which was a big hit too. If the mixture is becoming dry, simply add another egg or more creamed corn. My son LOVES these, and they make a great snack, or serve with fresh veggies for a really healthy dinner. When they’re hot and crispy and fresh from the pan, I add a little salt and wolf them down myself. They freeze well in freezer bags, travel in Ziploc bags and are perfect for breakfast, lunch or dinner. What’s your favourite toddler recipe? I am Jane’s fear and self-sabotage. Enter your email address to follow Ad Hoc Mamag and receive notifications of new posts by email.